Can you describe the process and the materials you used for the repair? Is the anvil still hard? Nice stand. Did you bolt the anvil through the base plate? Never seen it done that way. Unfortunately I consider sharp edges to be LESS USABLE than rounded ones; as they tend to mark the workpiece and cause cold shuts. From "Practical Blacksmithing", Richardson, Vol 1 1889 pg 111: "For my own part, I am satisfied not only that the sharp edges are useless; but they are destructive of good work. I cannot account for their existence except as a relic of a time when the principles of forging were but little understood." Anvils were shipped with sharp edges so the owner could dress them to the curve THEY wanted for the work They did. Like old European hammers being sold undressed---the factory didn't think they knew better than the end user. Oh, come on Thomas. There’s a place for crisp edges, a small place. I certainly wouldn’t want my entire anvil to have sharp edges but I like the keep the heel of my anvil sharp to mark a measurement or sometimes cut off hot steel. I prefer to use a hardy to cut hot steel myself. And most of my anvils have a progression of radii with the most rounded near the sweet spot and almost factory near the heel. I've just seen so many anvils damaged or destroyed by folks wanting SHARP! EDGES! that I tend to stomp on it when ever I can.---In particular: folks welding up the edges not understanding that the face is a higher carbon steel and so either using a nickel rod that is way too soft or not preheating the anvil and getting HAZ cracking that just makes the original issue worse. I've also seen a number of anvils where the face has been milled to to thin to be used. (I have a friend who did that once---and carried the useless anvil around for 20 years till we had an anvil repair day and a professional welder using industrial equipment spent 5 hours putting a usable face back on it). I've also seen 2 anvils where they milled completely through the steel face at one end or the other because that anvil's face and base were not parallel and instead of milling the base to be parallel to the face to start and then just kissing the face. They destroyed it's usability milling the face parallel to the base. It's quite possible to be a skilled welder or machinist and NOT know anything about anvils and their construction and use! If you had given a little history of your experience restoring anvils, it would have prevented a lot of typing. 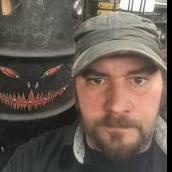 You have to realize we deal with and advise folks who have no idea what it takes to restore anvils and ruin them just because they have a welder and the idea that anvil edges should be sharp..
BTW: You did a fine job on your repair, wish you were close to me, as I have several that could benefit from your expertise. Yes the overwhelming majority of people we get new here, High 90%,, do not have your knowledge and skills and some of them have gone on to seriously damage perfectly usable anvils---You do realize that on a public forum we are writing to the entire world and not just you right? I'm not sorry I used your post to hammer home some lessons for folks less experienced than you. I am sorry you took it so personally. I've only been smithing 37 years now; spent a year apprenticed to a top swordmaker during the early part of that, (6 days a week in the shop, no pay but 2 meals a day with the family type of apprenticeship). 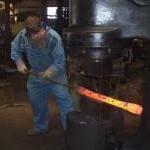 Was part of a bloomery crew for a dozen years; took a few MatSci classes at Cornell and have taught a Metallurgy student and helped out a Metallurgy Professor with forging. Taught a brief pattern welding class to a smith working at an Open Air Museum in Southern Germany. My real Wrought Iron scrap pile is about a long ton and I've forged it as well as smelted it. As people seem to think that anvils from 100+ years ago are special things I presented a quote from back then to try to get them to be Hippocratic: "First Do No Harm!" I think the ignore function is working. Until someone posts about their past, we can not tell the inexperienced from the experienced, or the expert. No reason for the Mods to get involved as long as it remains a polite and respectful conversation. My cut off hardy works both ways, depending on how I wish to cut.....jus' saying. If you did the repairs correctly, nobody can fault you for that. The anvil look nice. Here's my questions though.......How many years has that anvil been in use and why did none of the past smiths that used it felt they needed to redress the edges to make them sharp again? Please don't view those questions as an attack, because they are not meant to be. Most of us here come at this topic from a working anvil point of view. Sure, my German Trenton if restored back to original condition came with sharp edges, but after 125 years of use nobody who used it before me saw the advantage or necessity to resharpen the edges or redress them. That 125 years of smiths feeding their families from this anvil speaks volumes to me about how smiths in America used their anvils and more specifically the importance of not having sharp edges on their anvils. Perhaps things are different in France? We can only offer opinions on what we observe here and what clues history has provided us. We have advertisements from around 100 years ago where anvil manufacturers advertised that they would repair anvils sent to them needing face work up to and including re-facing by forge welding a new one on. 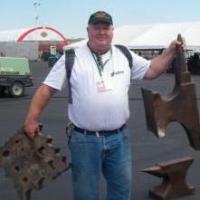 Some are shown in "Anvils in America", Richard Postman. I think we would use the term "farm smithing" instead of "peasant". I have reprints of the 1897, 1905, 1908 Sears Roebuck catalogs whither their complete blacksmithing set ups for sale under the slogan "Every Farmer Their Own Blacksmith" And yes over here as well Farm smithing is characterized by not generally being of the highest level but more of a "git er done with whatever is to hand..."
Blacksmiths over here certainly dressed the sharp edges of their new anvils. I would assume that if peasant or farm blacksmiths over here managed to accomplish this that our European counterparts had also figured it out rather peasants or aristocracy or somewhere in between. If you say Trenton anvils were peasant anvils, then your repaired anvil must have been more upper crust I would have to assume. How'd the edges get a nice radius on them? Surly you can give an educated guess as to the age of your repaired anvil. Even if it's only 50 years old, somehow the edges went from sharp and new to how they were when you found them. My point is simply asking how it got that way and why none of the smiths who made their living from that anvil saw fit to make the edges sharp. I'm really not trying to disrespect you or the fine job you did repairing that anvil, but you seem really defensive. I really enjoy my peasant Trenton anvil and am honored to be her most recent caretaker. I found her in a trailer covered with a tarp and brought her to her glory. This "peasant" likes his trenton as well.
" The peasants are revolting"
" The peasants ﻿are revolting﻿"
Yes, yes they are aren't they? Hey; I resemble that remark! Eh, most of my ancestors were wood workers. I still have 4 trunk toolboxes of their tools and junk from pre- American cival war and after. ( not surprising, a shopping list showed that they bought in bulk and didnt go to the store daily, possibly not weekly.) I just might be the first peasant in my household to do blacksmithing And own and like a trenton anvil. Back in circa 1627-29 a Sir ( knighted ) came to the new world . Records were kept in the log cabin courthouse at Jamestown , the courthouse burnt down so have not been able to track back further. That's all I know except it seems we have tilled toiled farmed and tended the lands thru out time. Dad left the farm right out of high school, after business school managed a propane company for 47 years. You folks need to cut people some slack: as stated repeatedly folks come here from 150 different countries. Lars is in France (as put in his tag line as most in this thread emphatically beat a drum for), and has a Scandinavian (not French) name - my guess is that his grasp and technical use of OUR first language is far better than our GRASP of his (and I’ve studied multiple but MASTERED none). His use of peasant for a small time rural farmer isn’t an unreasonable transliteration. Additionally it is true that there were anvils of a more professional type/quality and those that were perhaps less expensive and marketed towards either smaller shops or farm use, but weren’t ASOS. Those used by many farmers were outright ABUSED because the users had very limited technical knowledge or the finer points of smithing: chipped edges, chisel gauges on the face, etc. As a community we should shoot for kindness and civility unless someone else’s forces us to act differently. Far too often members here don’t try to see other points of view, nor give others the benefit of the doubt that they might be actually not only intelligent but maybe way more knowledgeable about MANY things than is assumed. If all the above is not true, then I’m Samuel Yellin or Vulcan himself. Is this the French revolution all over? Paysan in French is not necessarily derogatory as it is in English. It could be if you really want it. In English it would be hard not to interpret peasant as pejorative. Yet coming from someone that is French, or worse Scandinavian, you must be a bit less prone to offence. In Italian for example, paesano can be used as an affectionate term meaning from the same region. As for the anvil repair, I am more interested in the method used by Lars for this repair. Sharp edges or rounded, is a personal preference. After all it is easier to grind edges round but very hard to go the other way. Come on Lars, gives us a run down of the method and materials used. Yes Lars, tell us how you restored that anvil. We are interested in the process you went through to get the edges sharp again rather it is everyone's preference or not. A straight line is a terrible thing to waste. Just ask Frosty, or half a dozen others around here. The thrill of victory is getting there first, the agony of defeat: someone already posted what you were going to say. There was a very short-lived sit-com TV show called "When Things were Rotten". Lots of gags like the one I blatantly stole, plus "Peasants! Hold your tongues!" and they all oblige by sticking out their tongues and grasping them. Lots of poor-but-proud dirt farmers and lint-head textile mill workers in my family tree, just lucky to have some with a knack for the trades that passed it on to me. The closest we get to royalty is naming the dog Duke, or Rex. I was casting no aspersions on anyone, and I hope that no one was offended. While I can claim direct descent from the Plantagenet kings of England, I can truthfully say that it doesn’t have any effect on my blacksmithing. As John said, I was also just making light of it. I also meant no offense.